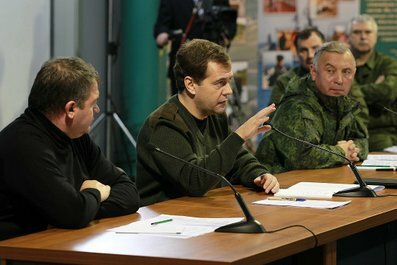 Monday President Medvedev met an unusual group — the Defense Minister, General Staff Chief, and MD / OSK commanders (but no service CINCs or branch commanders) — to announce he signed the long-discussed law on military pay that becomes effective on January 1, 2012. The increased military pay in this law was a key goal for Anatoliy Serdyukov when he arrived at the Defense Ministry nearly five years ago. Premium pay was just a stopgap. So this is a success for his reform program. His idea was to cut half (or more) of the officer corps and raise the pay of those remaining. Of course, he had to back off somewhat on cutting down to 150,000 officers. Why did it take so long to enact an increase in military pay? Was it hard to find the money? Maybe, given the global financial crisis of the late 2000s. Was it hard to overcome former Finance Minister Kudrin’s resistance to higher defense outlays? Newsru.com, Svpressa.ru, and others see the pay increase as timed to coincide with Duma and presidential elections, and designed to engender the military’s goodwill toward the current leadership at the ballot box. It’s worth noting the reduction in conscription from two years to one came in the context of the last national elections in 2008. According to Kremlin.ru’s account, Medvedev indicated he wanted to congratulate those assembled on their long, hard effort to raise military pay to its new level, on average 2.5 or 3 times above today’s pay. RIA Novosti provides the standard example of lieutenants rising from 19 to 50 thousand a month. In addition to higher base pay, the usual supplements will remain in effect, including additional pay for special duties, class qualifications, and difficult service conditions. Premiums of up to three times base pay for outstanding performance will also continue. Military pensions will increase at least 50 percent to 17,000 on average. Read more about pay calculations here. Not reassuring. But those guys won’t vote for United Russia and Putin anyway. So Medvedev declared it a test of governmental capability, and swiped at dear departed Kudrin who opposed the extent of defense budget increases in view of priorities like education and health (not to mention the pension fund). It takes capability to implement a decision, yes, but it takes even more to stick with it over the long term. Will the Russian government be able to continue the new level of military pay when the elections are over, economic conditions less favorable, oil prices and revenues lower, and budgets tighter? That’ll be the true test of capability. P.S. We shouldn’t forget that the Defense Ministry has also semi-obligated itself to paying 425,000 professional enlisted contractees 25,000 rubles or more a month in the future. That will probably equal the bill for paying officers. Let’s estimate this total cost at 500 billion rubles a year. The non-procurement defense budget in 2009 was only 670 billion. For Most Corrupt . . . The winner is . . . the Ministry of Defense. Novaya gazeta assembled respected independent experts to judge which of the Russian government’s 35 ministries and departments is most corrupt. The Defense Ministry edged out the Transportation and Economic Development Ministries. The experts said the five most corrupt (Health and Social Development is fourth and Finance fifth) have the opportunity to “saw off” 100 million to 1 trillion rubles per year (including budget money, and money that doesn’t reach the budget). A little context. Recall Defense Minister Anatoliy Serdyukov arrived four plus years ago promising to bring the Armed Forces’ notorious “financial flows” under strict control. But corruption scandals have only continued to flare around the Arbat Military District. Just a casual recent look: the Main Military Prosecutor says 20 percent of GOZ money is being stolen, Lipetsk highlights widespread premium pay extortion, the Chief of the Main Military-Medical Directorate is arrested for corruption. The list could go on. Look at the Novaya story in the vernacular for links to its original sources. Its experts focused on the closed nature of the defense budget, the impossibility of accounting for money allegedly spent on military R&D, the inability to confirm that work was actually performed, inflated prices, and a high rate of kickbacks. But they also focused on the simple fact that no one is officially in charge of significant amounts of defense money in the federal budget. Just by looking at budget lines, it’s clear to them that 600 billion rubles in defense spending (and perhaps much more) are simply unaccounted for. They also focused on Defense Ministry FGUPs that haul in enormous profits but remit little into the budget. And lastly they noted that fake health deferments from Voyenkomaty amount to an illicit 150-billion-ruble business every year. According to Kremlin.ru, President Dmitriy Medvedev traveled to the Gorokhovets training ground near Nizhniy Novgorod today to observe battalion-level ground and air maneuvers. It’s a modern twist on an old tradition of presidential speeches before end-of-training-year assemblies in Moscow. Medvedev inspected a new field camp, different weapons and equipment, and watched a Tunguska demonstration. Afterward he met brigade commanders observing the exercise, and addressed them about the process of reforming the armed forces. Medvedev said for two years Russia has been actively modernizing its armed forces to make them more compact, effective, and better equipped, and completing ‘org-shtat’ measures [i.e. TO&E changes] to achieve a ‘new profile.’ Flanked by Defense Minister Serdyukov and General Staff Chief Makarov, he promised the assembled commanders a defense budget worth 2.8 percent of Russia’s GDP every year until 2020, but he said getting this level of spending will not be easy, and it requires adjustments and cuts elsewhere. Medvedev told the commanders their brigades should be self-sufficient, modern, balanced, and capable of fulfilling missions given them, and he invited their feedback because, as he said, the success of the military’s transformation depends on it. Despite soliciting their honest opinions, one doubts the Supreme CINC will hear many complaints from this audience. They are, after all, winners in the reform process since they managed to continue serving in command positions. This is a downpayment on Russia’s Armed Forces: Year 2010. You can read about the authors here. The report’s not great, but it has interesting information not printed elsewhere. This picks up on Fomin’s earlier interview. Next look for their chapter on the OPK. The gist of the conclusion is this. There’s been no rebirth of the armed forces, in fact, many negative trends are now irreversible. There’s been no real rearmament despite higher budgets. The military doesn’t know how to set clear goals, and is planning to fight abstract threats like terrorism, instead of real ones like the U.S. Russia has money, but has invested it in currency reserves instead of its armed forces. There’s a myth that in the last ten years an incredible militarization of the country and rebirth of military power not quite to the level of the Soviet Union has occurred. As the analysis conducted showed, this does not correspond to reality – in reality a degradation of the Russian VS [Armed Forces] has taken place. Negative processes which began in the 1990s have reached their apogee today and are close to completion, because many negative tendencies in army development have taken on an irreversible character. Numerous reforms are confirmation of this: when everything is normal, reforms are not required. With growing expenditures, real rearmament is not happening and new equipment is not entering the forces as a practical matter. The defense-industrial complex is still relying on developments from Soviet times and no substantially new developments in post-Soviet times have been made that could even go into experimental, much less into production use. The analysis showed that the degradation of the Russian VS is conditioned on two main causes. The absence of a distinct system of goal establishment for the functioning and development of the VS. The affair has gone to the point that many military experts and analysts (not speaking of officials) are completely ashamed to clearly designate possible military enemies, and are trying to implement military organizational development under abstract sources of danger and threats. Any ordinary person understands that today and in the near future, there are only three such enemies: the U.S., NATO, and China. International terrorism is not an independent force, but only an instrument in the hands of the mentioned groups of countries. It should be clearly understood that ambiguity in goal establishment is just as ruinous for the condition and development of a system as a lack of resources. Nor is everything right when it comes to resources. More precisely, it is obvious they are insufficient even to hold a steady position. Miracles do not happen in program planning: if the amount of allocated resources drops to such a critical level, no improvement in the command and control system or reforms can make up for this. One does not need to speak of the country’s difficult financial problems. The country has money. In 2006 and 2007, $125-175 billion was transferred to the country’s hard currency reserves, respectively. $175 billion is, at the year average rate of 25 rubles/$, approximately 4.36 trillion rubles, that is 5 times more than all MO [Ministry of Defense] expenditures in 2007. This money was transferred into long-term, low-interest, and ‘highly reliable’ U.S. securities. So they assert. It is simpler to say an unreimbursed investment in the American economy. For this money, it would have been possible to maintain another five armies like the current Russian one. Even in the crisis of 2009, when we experienced a federal budget deficit, from the middle of March until the end of the year, nearly $60 billion was transferred into hard currency reserves, i.e. nearly 2 trillion is the volume of financing for another 1.5 such armies like Russia’s. But the financing of the Russian VS is not happening on the necessary scale. As a result, the real possibilities of Russia are being cut by leaps and bounds. This affects both military power and political influence abroad. Last Friday, Tatyana Shevtsova became the newest deputy defense minister – the ninth overall, seventh civilian, second female. By all accounts, Shevtsova will oversee and audit Defense Ministry spending and other activities. Kommersant calls her an ‘oversight and monitoring specialist.’ The Defense Ministry’s spokesman has said as much, according to Vedomosti (read it in Moscow Times as well). Shevtsova’s another member of Defense Minister Serdyukov’s former team at the Federal Tax Service (FNS or ФНС). Kommersant describes her as a ‘trusted individual’ who will help Serdyukov supervise all but the Defense Ministry’s purely military functions. In particular, several commentators believe Shevtsova will track outsourced service and support activities paid for in the state defense order (GOZ). The 41-year-old Shevtsova was born in Kozelsk, Kaluga Oblast, and graduated from the Leningrad Financial-Economic Institute in 1991. She’s a candidate of economic sciences (Ph.D.). She started in the tax service in 1991 as an inspector in the central rayon of St. Petersburg, eventually heading the tax service’s St. Petersburg directorate. Kommersant reminds that Serdyukov was a deputy director in the St. Petersburg directorate during Shevtsova’s time there in the early 2000s. Shevtsova went to Moscow to head the tax service’s large taxpayer department in early 2004. In mid-2004, Serdyukov became Director of the FNS, and Shevtsova became one of his deputies. Shevtsova stayed at the tax service under Mikhail Mokretsov after Serdyukov left for the Defense Ministry in early 2007. She was in charge of the oversight directorate and all nine inter-regional inspectorates for large taxpayers. When Mokretsov and others members of Serdyukov’s FNS team departed for the Defense Ministry in mid-2010, Shevtsova did likewise, becoming an advisor. According to one official who spoke to Kommersant, she spent the last few months ‘studying the situation’ in the Defense Ministry. A former Defense Ministry official told Vedomosti Shevtsova is “a talented economist as well as an exacting official, whose subordinates at the Federal Tax Service were very afraid of her.” She reportedly will turn ten Defense Ministry oversight bodies into a system. Kommersant said Shevtsova will direct oversight organs for administrative, organizational, and financial activities as well as military housing. The paper’s source says this could translate into oversight over everything except military command and control and operations. The ninth deputy minister will reportedly gain some responsibilities once discharged by the chiefs of the ministry’s apparatus, Rear Services, and Housing and Construction Service. Or anti-corruption one supposes . . . .
Igor Korotchenko told Vedomosti the Defense Ministry’s growing civilian component is designed to supervise the generals’ spending and accounting, especially in the GOZ. Ruslan Pukhov calls the ‘invasion’ of former tax officials perfectly normal since Western defense ministries are full of civilian auditors who scrutinize massive military budgets.